I’m one of the parents that can talk about recovery. Yes, functioning recovery! How could I not share my daughter’s journey and the therapies that made the difference? Now, as an Upledger CranioSacral Therapist with 14 years’ experience specializing in children with autism and sensory processing disorders, my goal is to share the benefits of the therapies that made the difference. 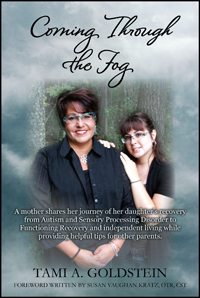 When my daughter, Heather, was diagnosed with autism we were given no hope for recovery. She was a month shy of her 13th birthday. I didn’t understand how a child could be so high functioning at times and so not functioning at others. I had a prominent developmental pediatrician at the local University Hospital provide a second opinion and she gave us no hope for recovery. She recommended institutionalization, so they could provide more medications. Heather had been seeing mental health providers, taking pharmaceutical medication for 8 years, and they weren’t working. That’s when I quit my job to research autism and look for other therapies and find ways to help her. Heather was diagnosed with sensory processing disorder almost a year later and presented by shutting down for up to 5 days where she couldn’t walk or talk. Her health picture was broad, she produced life-threatening levels of stress hormones, had 40 seizure a day, sleep issues – she had no restorative sleep stage, severe environmental and food allergies, attention deficient disorder (ADD), attention deficient hyperactive disorder (ADHD), obsessive compulsive disorder (OCD), obsessive defiance disorder(ODD), anxiety, depression and a very high IQ. We weren’t initially referred to an occupational therapist (OT) for evaluation for sensory processing disorder. After Heather’s diagnosis of autism, I networked across the USA looking for options. The OT we found was also certified in sensory integration and her evaluation showed Heather had a sensory modulation disorder; a sensory based motor planning disorder. She had issues with her vestibular, proprioception, tactile, auditory, olfactory and ocular motor sensory systems. She over registered the stimulation her body took in until she shutdown. We started sensory integration therapy and learned to understand Heather’s sensory system. Heather’s seizures and full body tic kept escalating with each school year. The neurologist advised since the seizure medication wasn’t working, and the seizures were not in the area of the brain as epilepsy, they wanted to perform brain surgery and “POKE AROUND.” Those were his words. I asked him to elaborate and he said, “We want to go in and have a look see about what’s going on in her head.” Every ounce of my being said no, and I cried my heart out to the OT who seemed to understand Heather in a way no one else did. Our OT, Sue Kratz said she was trained in Upledger- CST, it was non-evasive, and she felt it could reduce Heather’s seizures, reduce her anxiety and may improve her sensory system. I had never heard of it…. But she had me at non-evasive!!!!!! Heather was cooperative, laid on the massage table, allowed Sue to lightly touch her in different areas of her body, feet, legs, hips, ribs, shoulders, neck and head (As a therapist I realize not all children will be able to lay on a massage table. For these children we meet them where they are at. I provide sensory options while working on them and am frequently in motion with them). I asked Heather what she felt – you know the girl who over registered, who told a doctor she can tell when an aspirin hits her blood stream or where the food was along her digestion path; she felt nothing. Upon conclusion though, Heather jumped off the table, hugged me, full frontal hug, cheek to cheek…it was in that moment I realized Heather was so averse to being touched. I had become accustomed to kissing her hairline, but only with advanced permission. It had been 12 years since I felt her cheek on my cheek. I couldn’t wait to get home and tell my husband about this therapy I couldn’t pronounce nor explain how it was administered but she hugged and kissed me. The next day, instead of a typical 5-day shutdown, she was up early, she could make eye contact, ate with us at the table! Heather liked to eat with her fingers and usually ate alone in her room. She now sat at the table eating with utensils and engaged in conversation. She was bright, articulate, funny and we could see the young women trapped within her body had emerged. What is U-CST? Upledger CranioSacral Therapy was developed by Dr. John E. Upledger in the mid 1970’s and gets its roots in osteopathy. Osteopathy was founded on the concepts that the body is a unit, structure and functions are interrelated, the body has self-correcting mechanisms and drugs are harmful. The difference between cranial osteopathy that looks to mobilize suture lines (where bones connect) in the skull is that U-CST uses the bones of the skull to make corrections to the structure beneath. U-CST releases restriction patterns through the fascia or connective tissue of the body. Everything in the body, every organ, cell and muscle is connected through fascia. It improves the environment the brain sits in and when you improve brain function it improves all the systems of the body. The craniosacral system is made of the brain, the connective tissues that protects the brain, the cerebrospinal fluid that nourishes and removes waste from the brain, the bones of the skull, mouth and spine. The brain’s process of producing or not producing cerebrospinal fluid generates a craniosacral rhythm. As CranioSacral Therapists, we can evaluate this rhythm to see if a restriction is a source of a problem or a symptom the craniosacral techniques are facilitated. In 2016, a study was published in the Medical Periodical Journal of Bodywork and Manual Therapies, The Use of CranioSacral therapy for Autism Spectrum Disorders: Benefits from the Viewpoints of Parents, Clients and Therapists by Susan Vaughn Kratz, Jane Kerr and Lorraine Porter. It was a year-long study with responses from around the world. Two hundred and sixty-four therapists, one hundred and twenty-four parents and a small sampling of clients responded. Therapist followed a 10-step protocol designed to mobilize connective tissue and fascia to identify structural restriction throughout the entire body. The study showed a variety of clinical findings, but the perceived behavior changes observed are noteworthy. Parents saw a 60.3% improvement in 1 to 3 sessions. Areas of improvement included general behaviors, reduction in sensory reaction as well as improvement in social skills, cognitive skills, communication, emotional stability and biologically. My Heather improved in many of these areas as well. We could see that the U-CST helped reduce her seizures, her tic, her OCD and reduction in her sensory reaction. But once we sent her back to school or in certain environments, she regressed. Our OT recommended Biomedical Therapy in addition to the sensory integration and CranioSacral Therapy we were accessing. The Biomedical piece looks at the diet and chemical makeup of your child. Our doctor, the late Dr. John Hicks, MD systematically replaced what was missing in Heather’s chemical foundation, chelated heavy metals from her body and put her on an elimination diet appropriate for her. The doctor explained it would take about a year, but her body would jump start and produce many of the chemicals she currently wasn’t producing on her own. Heather took 38 supplements, vitamins and minerals a day to repair her system. This took her to another level towards recovery. Our problem was every time Heather tried to attend school full-time, 8a to 3:30p, five days a week. She simply couldn’t sustain, and the OT explained the added demands and higher levels of analytical thinking required for middle and high schoolers was sensory overload for my daughter. The OT started to develop a sensory diet for Heather, so she could self-access the sensory integration supports she needed in the environment she needed them to maintain functioning. Heather’s sensory diet includes U-CST techniques that she can self-access. When Heather started self-accessing the supports she needed in school, she reduced her absenteeism from 75 days to 23; she increased her ability to sustain from 3.5 hours to 6 and stopped having shutdown. Heather now lives a sensory lifestyle. Each day she monitors her current sensory state, so she knows what support to self-access or call to set up a full U-CST session. Heather did graduate high school, a secondary school, drives a car, which took 4 years and sensory supports to accomplish, works part-time and brought her own home in 2012. Facilitating this work as a therapist I have seen non-verbal children begin to speak, children who failed to potty train or chronic bedwetters no longer having those issues. I’ve seen children who were self-abusive, banged their head or been a danger to others resolve those behaviors. I’ve also seen very low functioning children, non-verbal at age 5, now as young adults, are leading independent productive lives. My take away is that Sensory Processing Disorder is a disability about brain function. Sensory Integration Therapy teaches you how a sensory system works, the biomedical piece makes sure the brain has the chemical foundation it needs to grow and sustain, and Upledger CranioSacral Therapy improves brain function. That’s a powerful multidisciplinary approach for recovery. When asked what helped Heather the most, she will tell you Upledger CranioSacral Therapy (U-CST). I believe CST offers the recipient their greatest potential for recovery!